You're in a highly volatile, hopeless, life-threatening situation. How far would you go to ensure your survival? How deep can you dig, within yourself, to find what's needed to make sure that happens? And even if you do happen to come out of it alive, the unquestionable changes to your life a traumatizing experience like this would have begs the question, "Was survival worth it?" 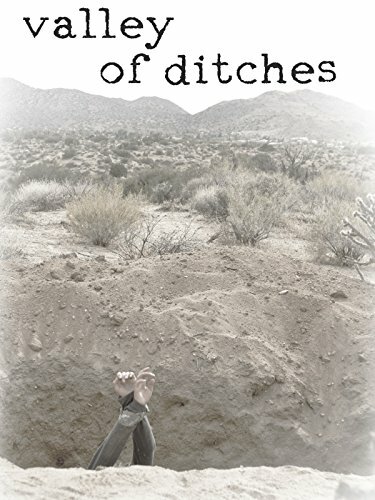 All of these difficult questions asked, and assertions tackled, by Christopher James Lang's intensely stressful survival horror-thriller, 'Valley of Ditches'. A young woman bound in the front seat of a car watches helpless as her captor digs a grave in the desert ground. The lifeless body of her boyfriend lies framed in the rear-view mirror, a fate she will fight at all costs to avoid for herself. But this is only the beginning of a brutal struggle where survival could be worse than death. The film wastes no time in implicating the harrowing ordeal that awaits, opening with the question, "Are you afraid of dying?". Taking bound protagonist Emilia (Amanda Todisco) and throwing her out of the frying pan and into the fire. Immediately made to endure cruelty in the form of mental, physical and spiritual torture at the hands of her captor, religious zealot Sean (Russell Bradley Fenton), there's no question that if things are ever going to get better for her, if there is ever a chance for hope, it won't happen until after things get much much worse. 'Valley of Ditches' keeps a steady pace in its acceleration towards meaner and crueler plot devices, but it's not just what's happening at the present that Emilia is forced to contend with, but the past as well. Through the use of inter-cut flashbacks, we are shown that the current terrifying situation isn't the only one in which Emilia has had to suffer through. And as the present continues to push on towards unrelenting despair, it's these key memories that give us some insight into the kind of resolve we wouldn't have otherwise known was present in her character. At the lowest point then, when all hope is seemingly lost, Emilia is able to draw strength from this well of past experiences in order to triumph once again. Its an emotional juxtaposition, and works to engage the audience on a deeper level, leading to a conclusion that's truly affecting in its - intensely violent - catharsis. Not to give much more away, we can say that for better or worse, 'Valley of Ditches' neatly wraps up its story. Though I personally found the "how" to be a minor point of contention, the entire ride was something that ultimately ended up being a very positive, very well-acted multi-genre experience; a lean, mean indie outing worth your time. You can experience it for yourself on popular video on demand services, most likely by the time you read this review.